These 10 Party Lights MixTape Lighted Centerpiece Lamps will add the fun and life into any party or event! 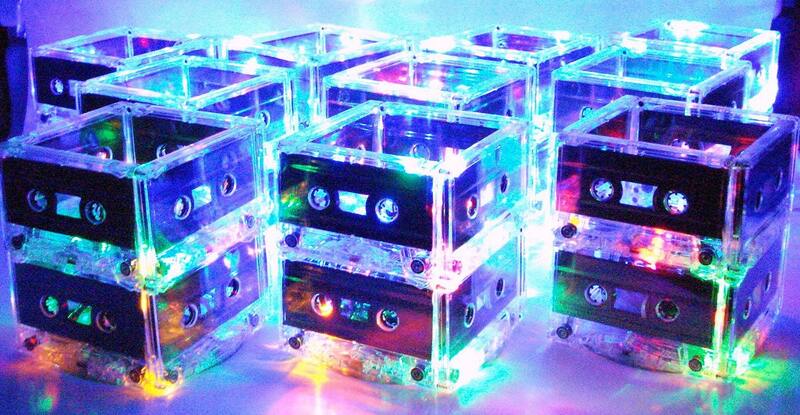 This listing is for 10 Mixtape Cassette Tape Lighted Centerpieces. Perfect centerpiece or other table decoration for any music themed wedding or 80's, 90's or music themed party! Your guests will love these totally unique and retro Cassette Tape Centerpiece Lights. They will be fighting over who gets to take one home. Each centerpiece is made from 8 very rare completely blank cassette tapes and one CD handcrafted into a super fun rockin' retro lighted centerpiece holding 20 battery operated multi-color mini LED lights. Can also be made to hold water if you plan to add fresh flowers. Just be sure to put in note at checkout when making purchase. I STILL HAVEN'T RECEIVED IT YET! The product showed on time and the owners communication was greatly appreciated. these were such a fun addition to our 80s halloween party! product shipped quickly and arrived in perfect condition, exactly as shown in listing. I accept Paypal as well as credit cards via Etsy's Direct Checkout. If payment is not received/cleared within 48 hours of purchase, the transaction may be cancelled and the item will be relisted. I will accept a cancellation within 24 hours and refund your purchase, unless the item has already shipped. Refunds are not an option on large quantity centerpiece orders. For single item orders, if your item arrives and you are not satisfied with any aspect, please CONTACT ME IMMEDIATELY PRIOR TO LEAVING FEEDBACK, and I will do everything I can to make it right. I am very committed to the products I make, and want you to love them as much as I do. Internationally shipped orders are sent via Parcel Post to keep your total costs as low as possible. If you would like to pay the expense for it to be sent via Priority Mail (6-10 day delivery), send me a message and I can create a custom listing for you. I do the best I can to provide efficient international shipping, but once a package leaves the US I have no control over the shipping time. I can only estimate the time, because all countries have different customs policies and can choose to hold packages for varying lengths of time, in some cases 30 days or longer. I cannot be held responsible for items getting held up in customs in your country and you are responsible for any duties. Returns will be reviewed on a case by case basis. Returns are not an option for large quantity centerpiece orders.